On July 2, the June Class and Component Prices were announced. 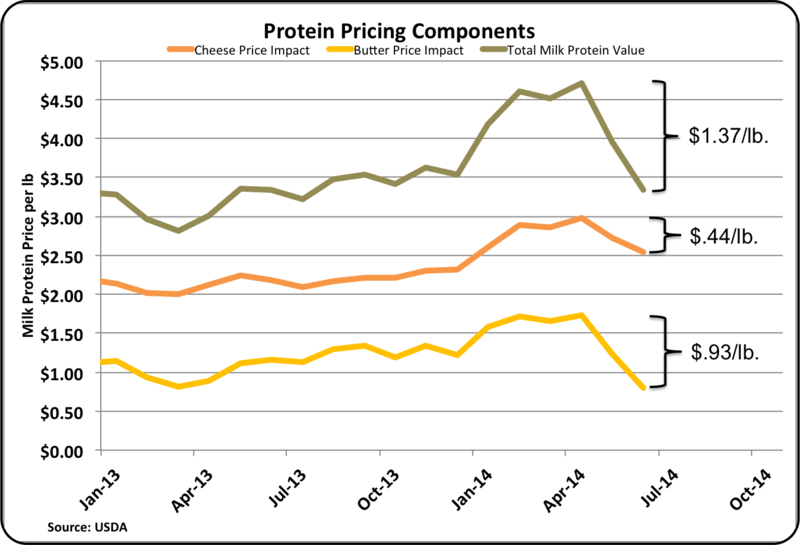 Cheese and milk protein prices were down, but butter and butterfat were up significantly. The Class III price was $21.36/cwt., down $1.21/cwt. from the prior month. The comparison to the prior month is shown below. 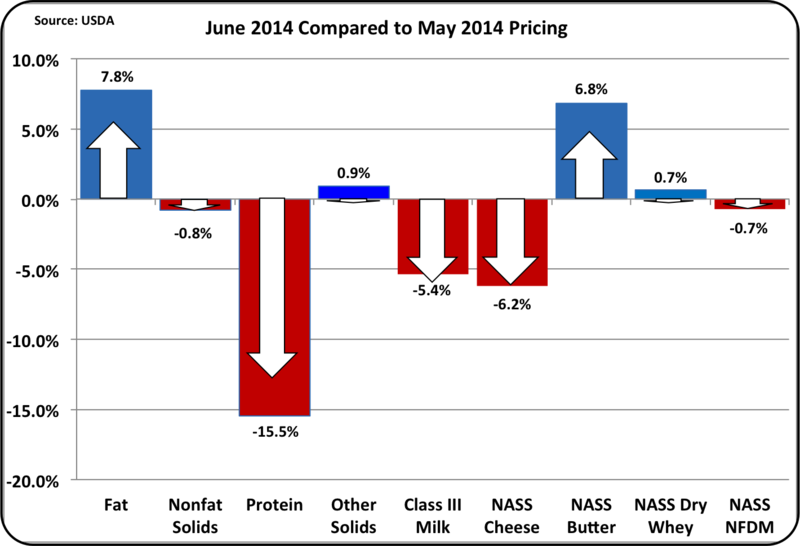 To put this in perspective, the June 2014 prices are also compared to the June 2013 prices in the chart below. 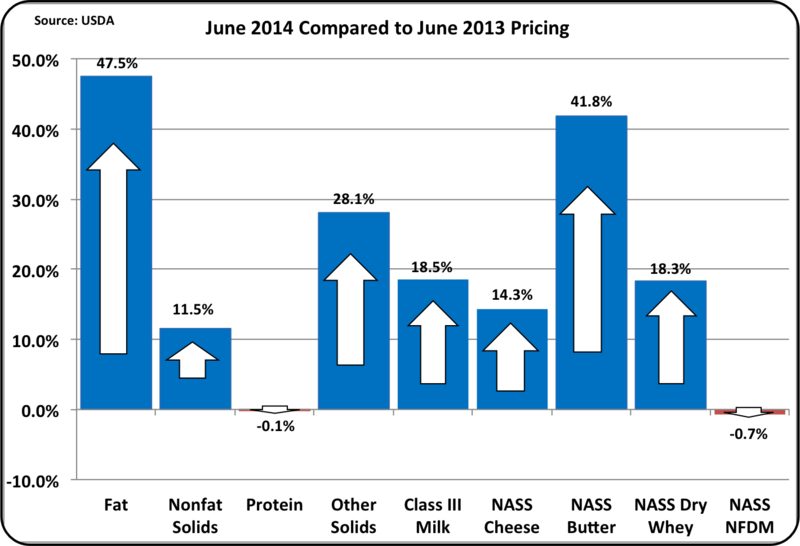 As can be seen in this chart, the June 2014 prices are quite positive vs. one year ago. While the June compared to May chart shown above presents a negative picture, it is only negative because of the exceptional prices seen in the earlier month of 2014. The chart below shows the long term trends in component pricing. 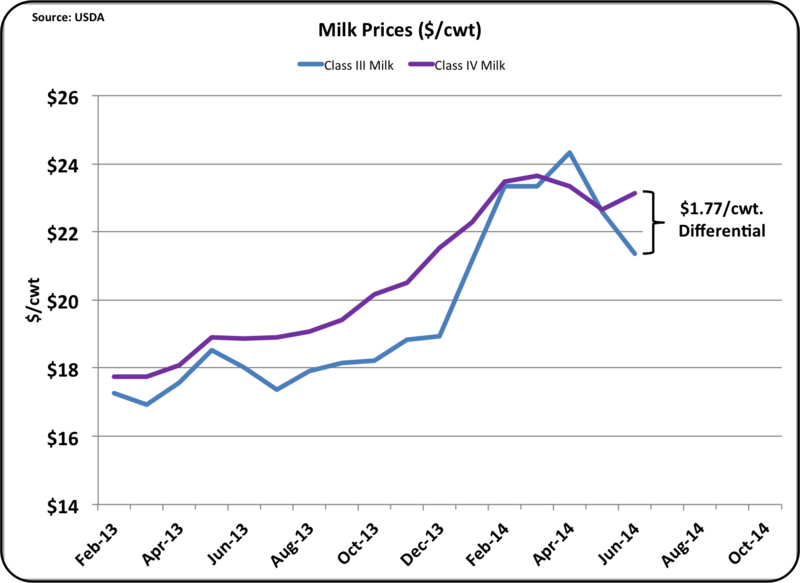 Butterfat is at record price levels and other solids remain near record highs. Butterfat, which is currently worth $2.45/lb. is at a price level that has only been exceeded once before, ten years ago in April 2004. 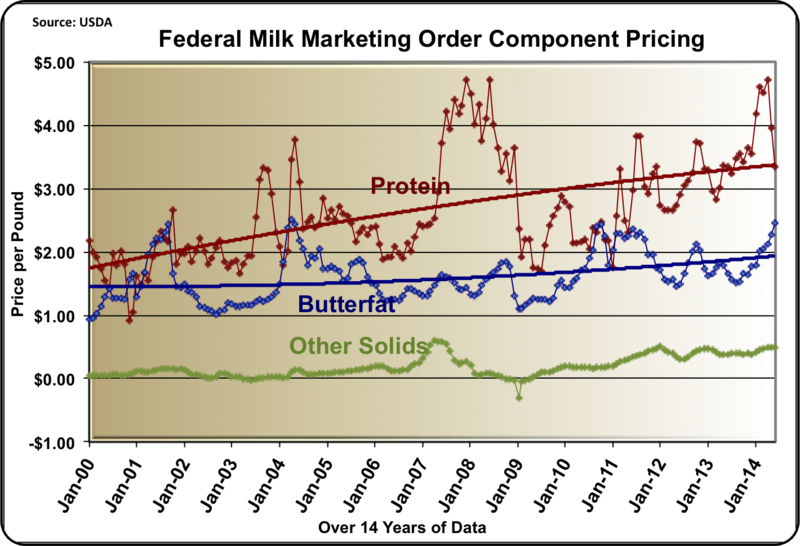 The price of butterfat is mathematically linked to the price of butter. 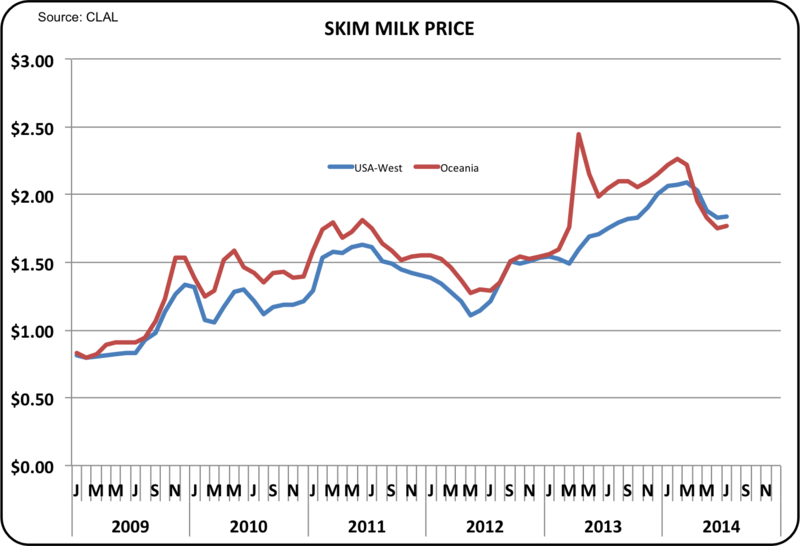 The price of milk protein has dropped to $1.37/lb. in the last two months. This represents a 29% drop. The reason for the drop has mostly to do with the dramatic price increase in the wholesale price of butter. Milk protein's value is based on two factors, the wholesale price of cheese and the increased value of butterfat when it is used in cheese rather than butter. Of the $1.37/lb. drop in the value of milk protein, $.93/lb. is caused by the increased value of butterfat. Only $.44/lb. has resulted from a decrease in the value of cheese. For a more detailed analysis of the math behind these calculations, see the August 8, 2010 post to this blog. The other important development in June, was the very strong Class IV price. Currently the Class IV price is $1.77/cwt. higher than the Class III price. When the Class IV skim price is above the Class III skim price, it becomes the basis for Class I pricing. 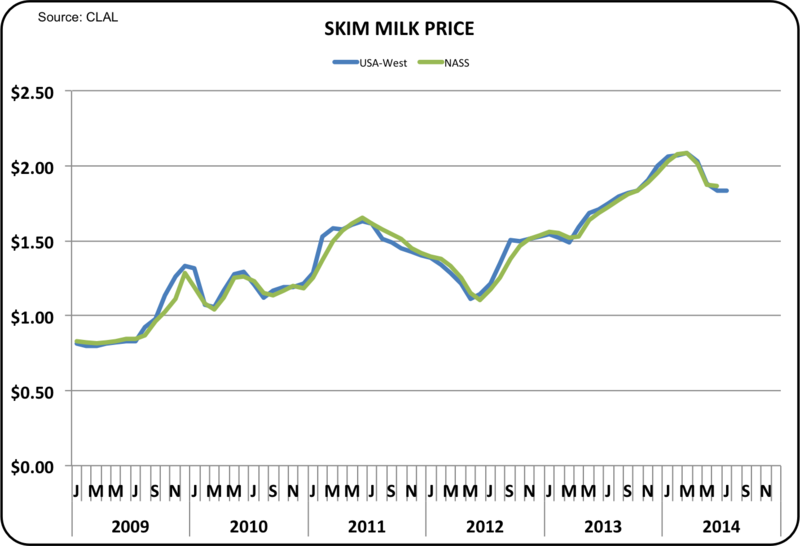 The Class IV skim price is also used to calculate the Class II skim price. This has a positive impact on the producer price differential for those paid on the Federal Milk Marketing Order Component system, and also has a positive impact on the Class I skim milk price for those paid on the Federal Milk Marketing Order Advanced system. 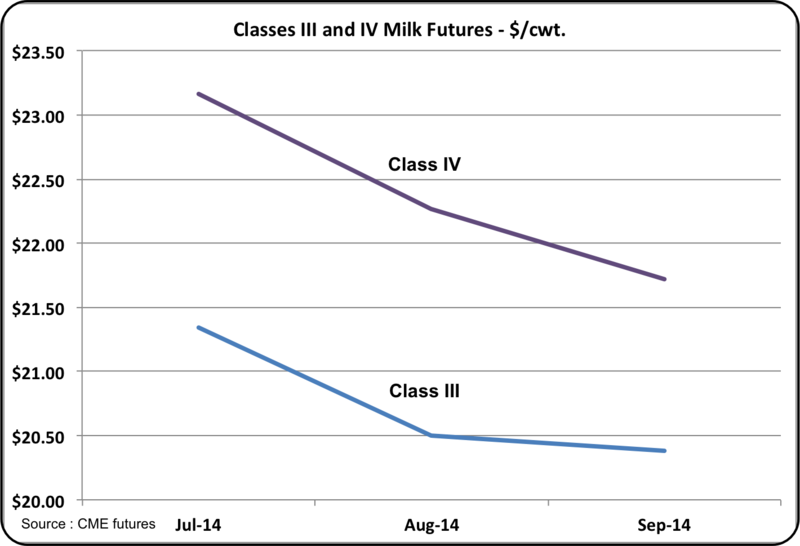 For a full review of the importance of Class IV pricing, see the February 25, 2014 post to this blog. The Class III/Class IV price differential as expressed in the CME futures market indicates a continuance of Class IV prices above Class III pricing for the next three months. While both prices are expected to see some decline, the higher price for Class IV is expected to continue. Rabobank has recently released their Q3 global dairy market analysis. As usual, it is very informative. 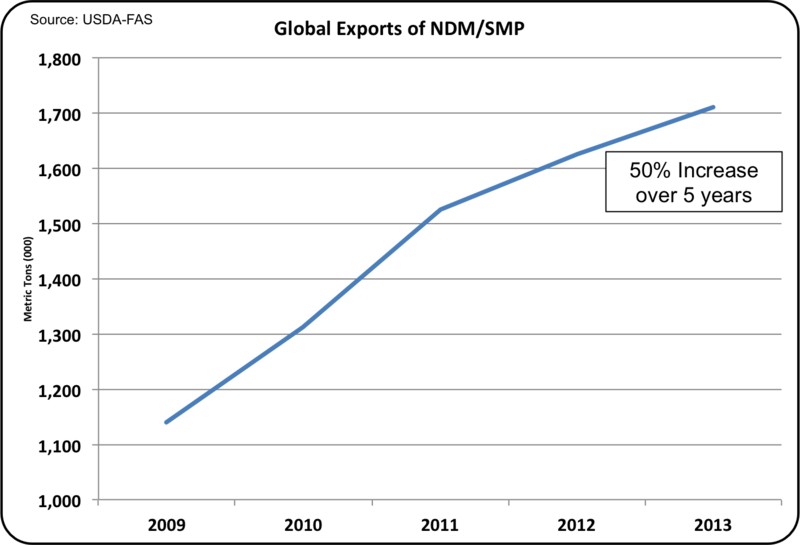 The U.S. dairy industry has become increasingly involved and increasing dependent on exports to the global dairy market. 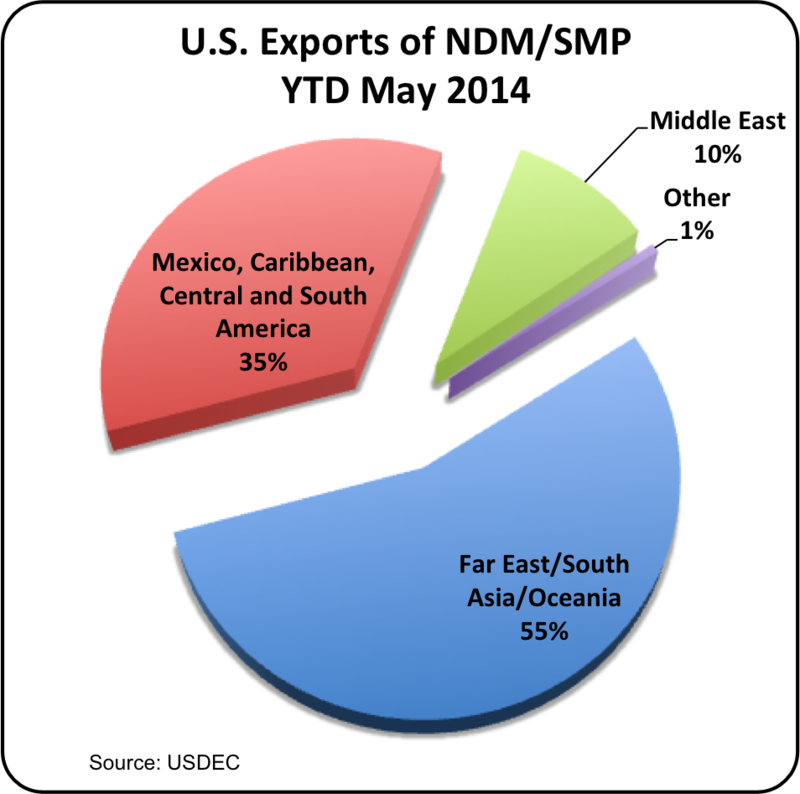 This puts U.S. dairy industry pricing very much dependent on international developments. The Rabobank report sites very strong milk production increases in the EU and New Zealand, the two largest global exporters of dairy products. They also expect significantly reduced imports from China. 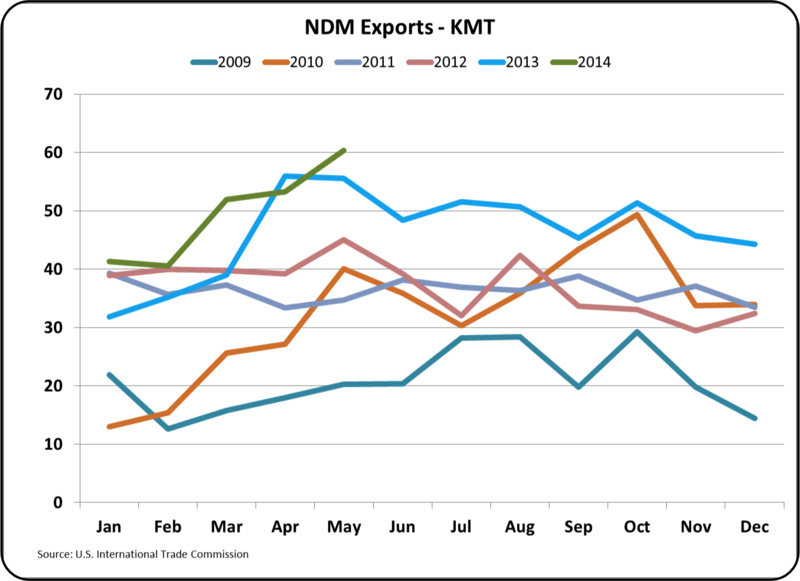 Because U.S. dairy prices have not YTD significantly declined, they are projecting H2 price declines for the U.S. due to increased global supplies. New Zealand is the main supplier to China, so if China reduced purchases, New Zealand would have to look to new International markets to find a home for their huge export business. This would increase international competition and could significantly reduce international dairy prices resulting in lower prices and reduced volumes of U.S. dairy exports. On the other hand, the U.S. 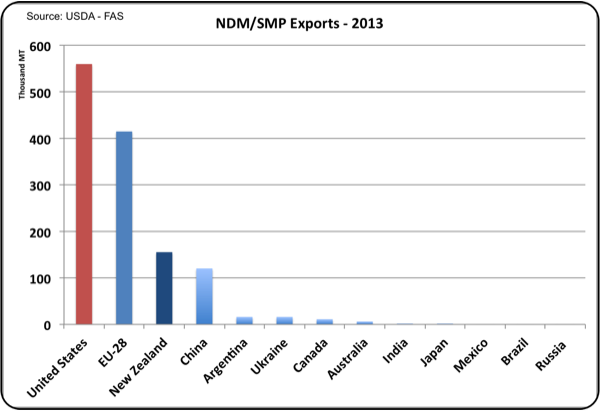 Dairy Export Council recently released a paper on China's growing imports of dairy products. This paper may have a longer term viewpoint, but the two recent releases from reliable sources seem to be at odds. Adding to the complexity of the analysis is the make-up of the export items. 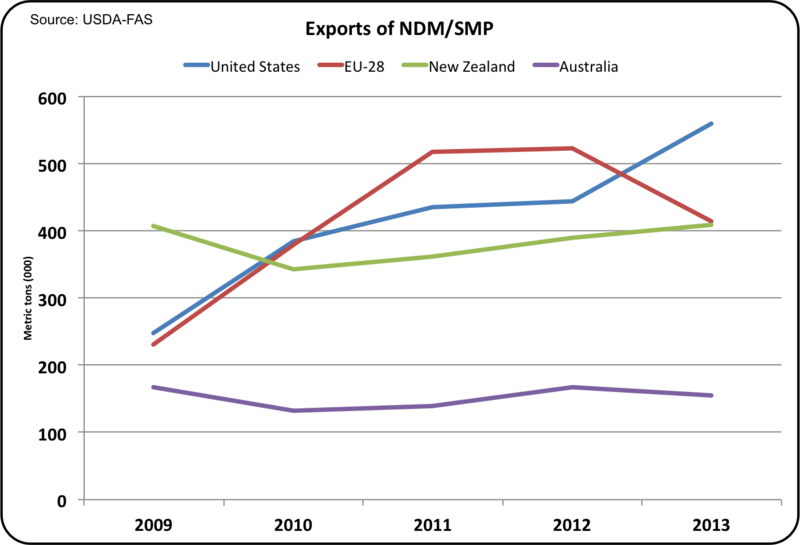 China imports primarily whole milk powder and the majority comes from New Zealand. Whole milk powder is a market that the U.S. does not significantly participate in. 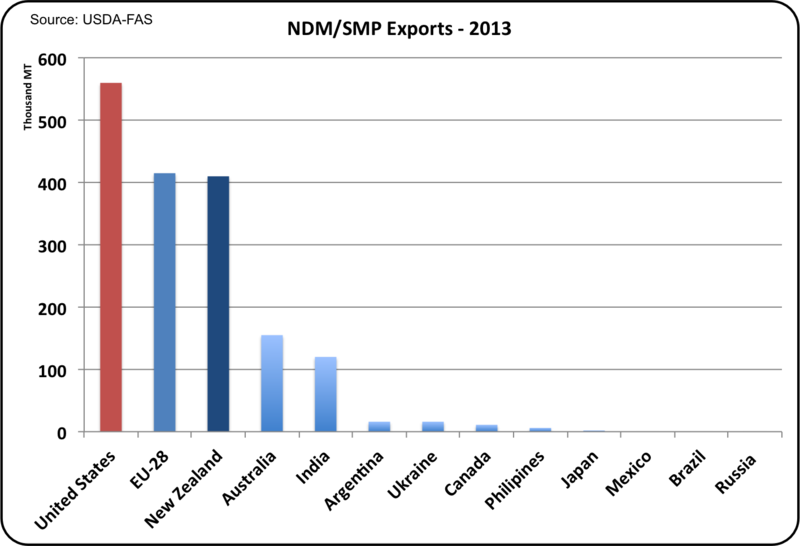 The U.S. is the world leader in nonfat dry milk/skim milk powder exports but China imports only about 10% of the U.S. nonfat dry milk/skim milk powder exported. These facts would suggest a limited impact on U.S. exports. The first half of 2014 is finished. Additional H1 data for analysis will soon be available and additional analysis of this data will be posted to this blog later this month.